Requirements: Compatible with iPhone 3GS, iPhone 4, iPod touch (4th generation), iPad 2 Wi-Fi and iPad 2 Wi-Fi + 3G. Requires iOS 4.0 or later. 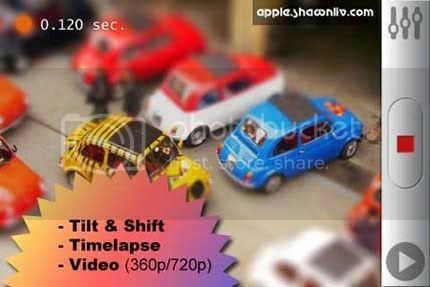 Description Create time-lapse miniature movies using your iPhone! – Control shooting interval in wide range. – Apply Tilt & Shift blur effect. – Create videos directly on your device. All together makes everything look like it is a miniature. No further post processing is required. – To avoid interruptions disable phone calls (Airplane mode). – Use tripod or substitute to ensure your phone will not move during recording. – Connect charger for long sessions.